Edit: when I try to upload an image here on the message board with the attachment function, it says "The attachments upload directory is not writable. Your attachment or avatar cannot be saved." 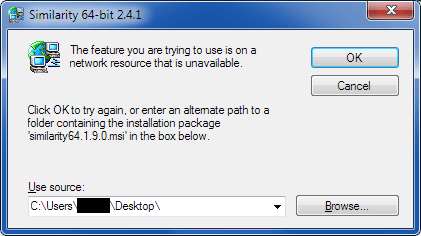 Ever since I use Similarity, the installer doesn't work with a Windows user account. It asks me for the admin password, which I enter correctly, then the installer shows an error message that a resource/folder could not be accessed, the old version can't be uninstalled and the installation is cancelled. I always need to switch to my actual admin account, redownload the MSI file, install it, then switch back to my user account, which is tedious just because Similarity wants to be special. I don't have that problem when I install other software while I'm logged into my user account. I can type in the admin password and the installation works. Therefore it must be something wrong with the MSI file.